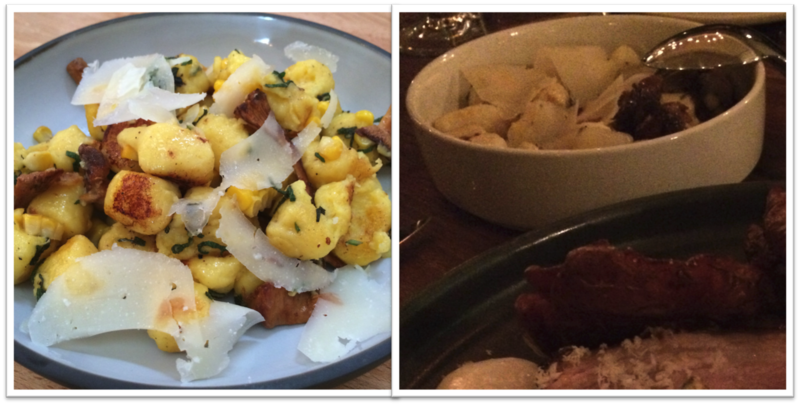 We’ve been a little slack with blogging lately and hope to remedy that situation starting with this long overdue post on Oro, Chef Jason Fox’s follow up to the newly (and finally!) Michelin-starred Commonwealth. Opened last September, Oro (Spanish for gold), is named after its location in the historic Mint Plaza. It took over the spot that initially housed Chez Papa Resto, followed by the short-lived Thermidor. In partnership with former Zero Zero general manager Timothy Felkner, Chef Fox smartly brought along Travis Day from Commonwealth to act as his chef de cuisine. Chef Day specializes in whole animal butchery where his experience from Commonwealth, Central Kitchen and Fatted Calf is integral to many of the dishes found at Oro. 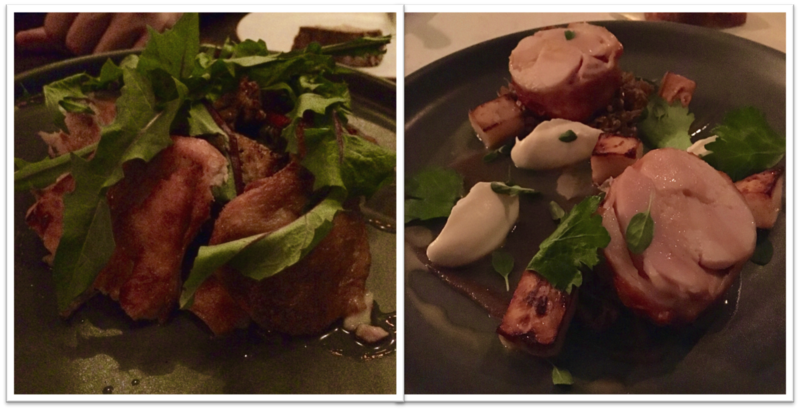 It’s rare that we get to follow a restaurant from inception, opening and established presence, so this post is a little different than others: it documents several visits to Oro, from its preview dinner served at Feastly last July through our most recent visit. Their menu is highly seasonal; although some of the menu items below are no longer available or come with different ingredients, they are very representative of the “gold” that comes out of the restaurant’s kitchen. We always order the Halibut Chicharrones off of the snack menu as it is one of our favorite items at Oro. 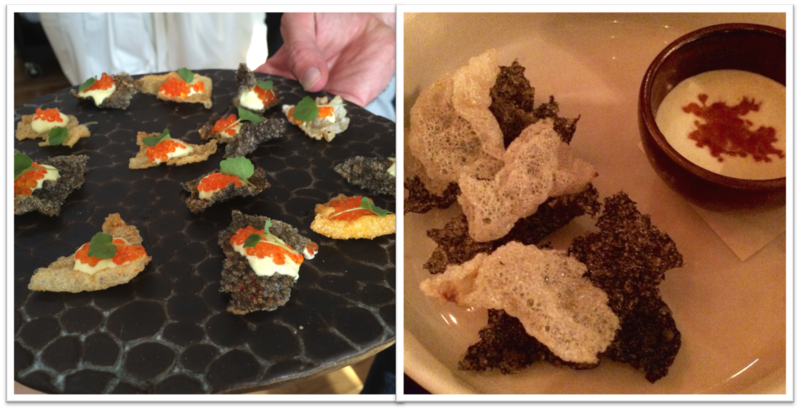 Shown on the left is how it was plated at the preview dinner as individual bites, and how it evolved into a chip and dip plate at the restaurant (right). The fish skin “chips” are hardy enough to scoop up the tasty crème fraîche and trout roe dip. We often wonder what happens to the rest of the fish, as halibut is not often on their menu, but luckily this snack is. Note: click on any photo to view larger. 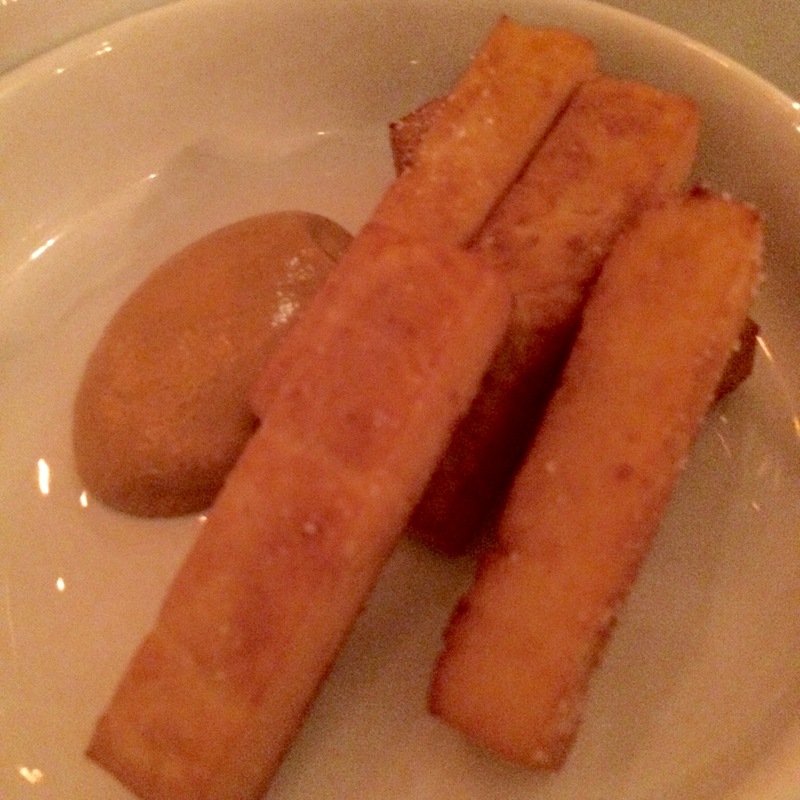 Another snack item on offer is the chickpea panisse frites served with romesco sauce. We’re not sure why these crispy-on-the-outside-but-creamy-on-the-inside fries haven’t made their way onto more menus. We have found them at Frances and Bouche but are now glad to find another place to order these soldiers. Single bite items are ordered by the piece and don’t require silverware; but they do require more than one bite to consume. Many of the options are served on toast points, but there are other items like croquettes or lamb riblets that come bread-free. 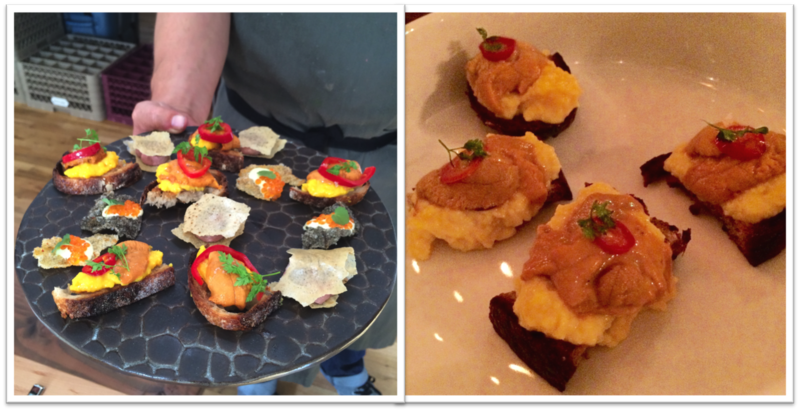 Our favorite item from this section is easily the grilled bread topped with sea urchin, scrambled egg and pickled jalapeño (right). It is identical to the version they served at the preview dinner (shown left with other “bites”) and is likely to become their signature dish (if it isn’t already). 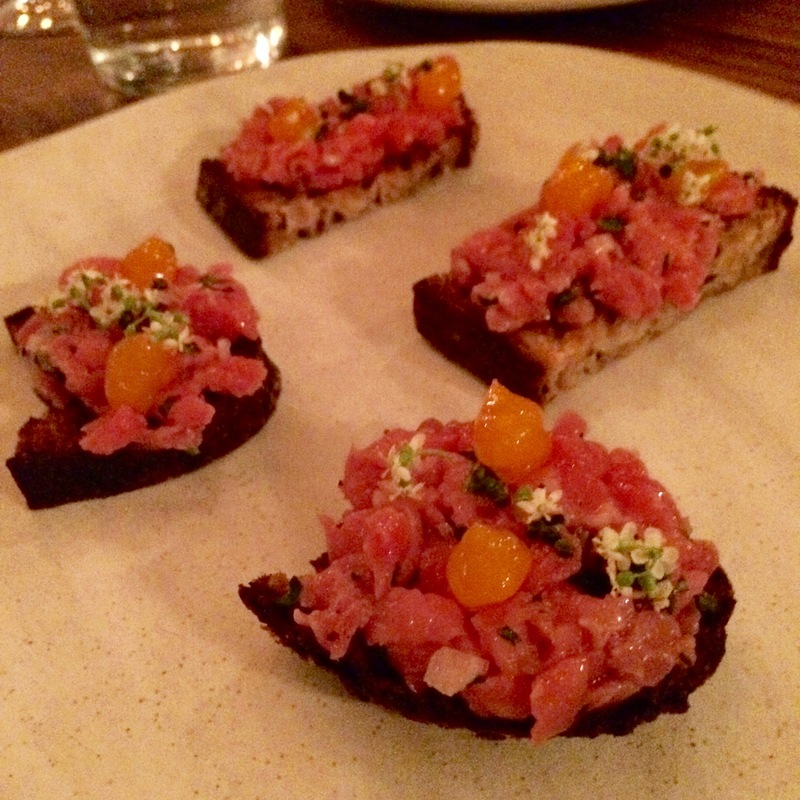 The other awesome single bite item is their ancient grain crostini topped with beef tartare and cured egg yolk. 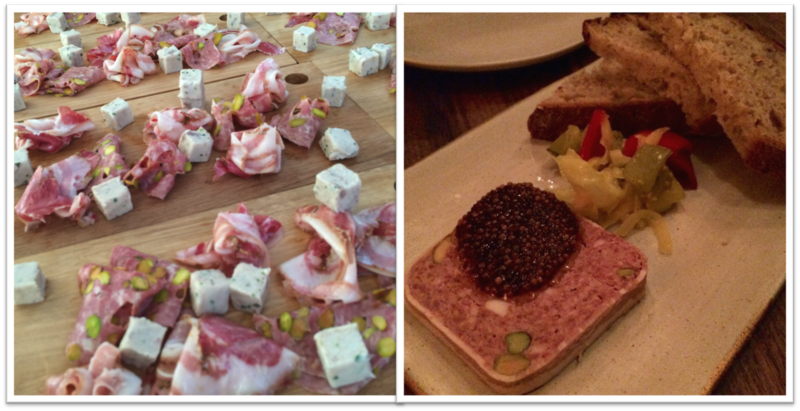 We know Chef Day knows his way around an excellent charcuterie program, as was evident at the preview dinner — several selections were on offer (left) such as house-cured hams, mortadella and rabbit rillette. Served in a cube form, the rabbit astounded us since it’s not a protein we normally prefer. Lucky for us, our Feastly tablemates also had no desire to eat Thumper, so we were able to hoard most of the cubelettes. When Oro initially opened, the charcuterie was only served as part of the Blind Tasting menu, and later became an off-the-menu-item request. Now it has its own section of the menu, featuring house made salumi and terrines as they are cured and available. The charcuterie can be ordered individually for $6 or as a platter of four items for $21, typically served with giardinara, bread and mostarda. We long for the rabbit rillette, which hasn’t made an appearance since the preview, but the pork terrine (right) sated our need for spreadable meat. Now we move on to the small plates section of the menu, where salads can be found. 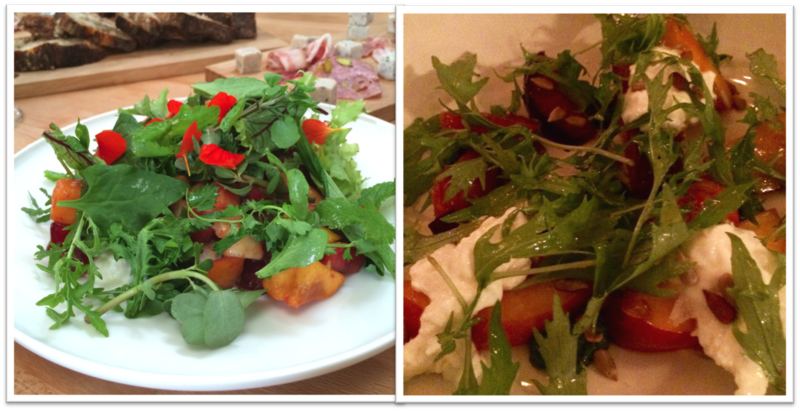 At the preview dinner there was an excellent salad with mixed greens served with stonefruit, sunflower seeds, burrata and nasturtium pesto (left); this made it to their menu (right) and was served while the fruit was in season. Their featured salad seems to include a sweet element accompanied by bitter greens and cheese. As of publication, the current offering is treviso (radicchio) with beets, tangerine, black olives and crescent cheese. The Small Plates section also list many of their fried items. 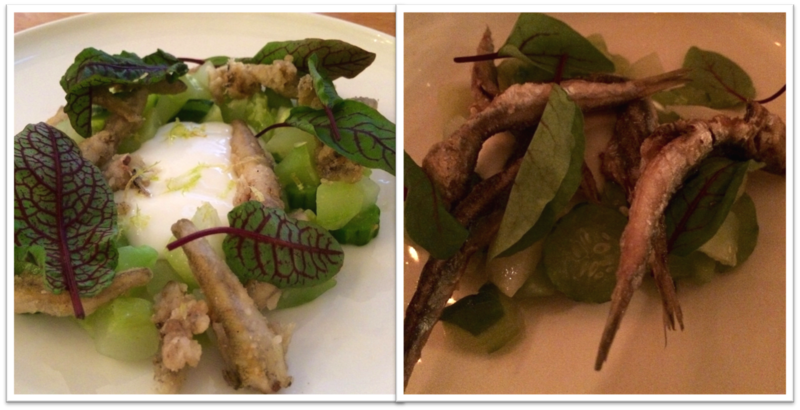 An excellent plate of fried sardines served with cucumber and whipped buttermilk were the served at the preview dinner (left) and at opening (right). Currently, they offer fried pig ears and a fermented chili sauce served with the whipped buttermilk (we’ve already made a note to return for this dish). 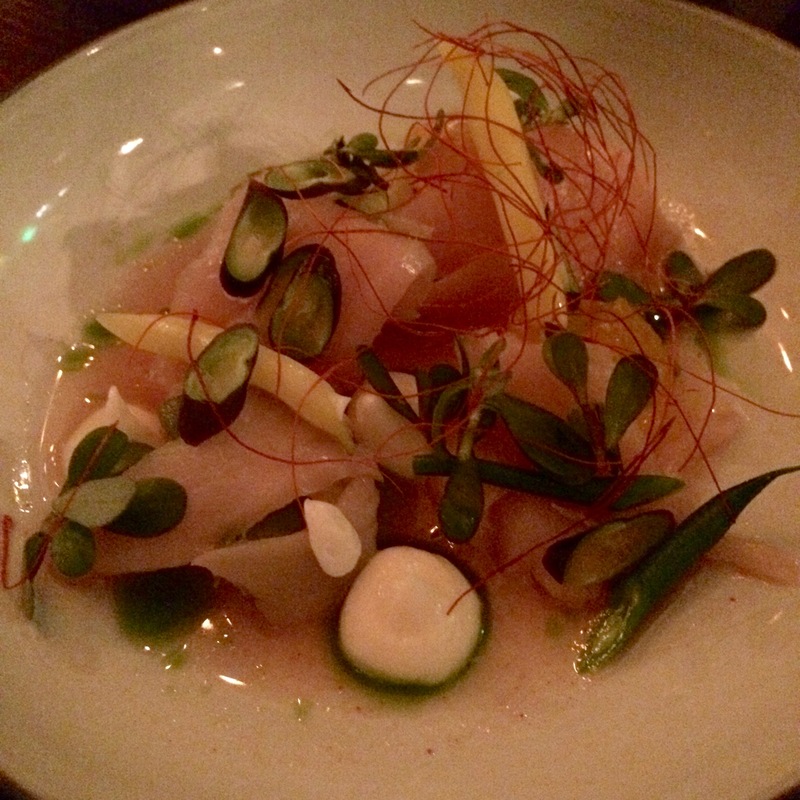 A version of fish crudo can also be found in the small plates section, On one of our visits they had an excellent albacore tuna served with lardo, beans, purslane and melon — all beautifully plated of course! When Oro first opened last September, it was one of several restaurants that tried to do away with tipping, so service was included in the pricing. It didn’t take them long to abandon that model, especially when a review by the local critic was overshadowed by the over-priced large chicken plate. We had ordered that roasted half chicken dish, served with a tomato and swiss chard panade (similar to bread dressing), and thought that while it was good, pricing was steep at $46. Their more recent incarnation of chicken is now on the smaller plates side, and it is a must-order and relative bargain at $21. The chicken roulade is served with salt-baked celery root, sprouted grains and drizzled with a foie gras and toasted barley jus (right). To date, our absolute favorite Oro dish is the large Porchetta plate from their opening menu, with service included for $68. Accompanied by a smattering of grilled cucumbers and grated horseradish, there was plenty of tasty pork with super crispy skin to share. It’s easily the best porchetta version we’ve ever eaten. 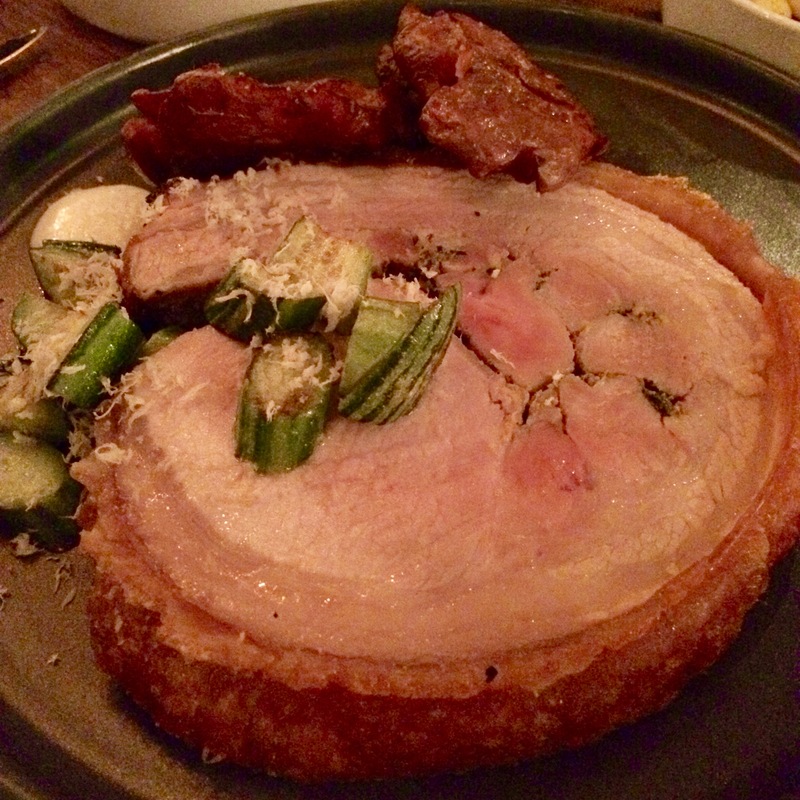 On their subsequent, non-tip included menus, the Porchetta was replaced with a “daily pork roast” that we have ordered a couple of times, hoping for the rolled version. Alas, the daily pork roast is still good, but not nearly as spectacular. They need to add a porchetta cam or tweet when its available, and we’ll dash right over – it really is that great. One of the items we always order is their excellent fluffy potato gnocchi dish, served with kale, sage, maitake mushrooms and truffled pecorino cheese. It came with corn at the preview dinner (left); otherwise, it has pretty much stayed intact from opening through their current menu. It’s on their small plates menu, but we always order it as a side dish to accompany a larger protein dish. 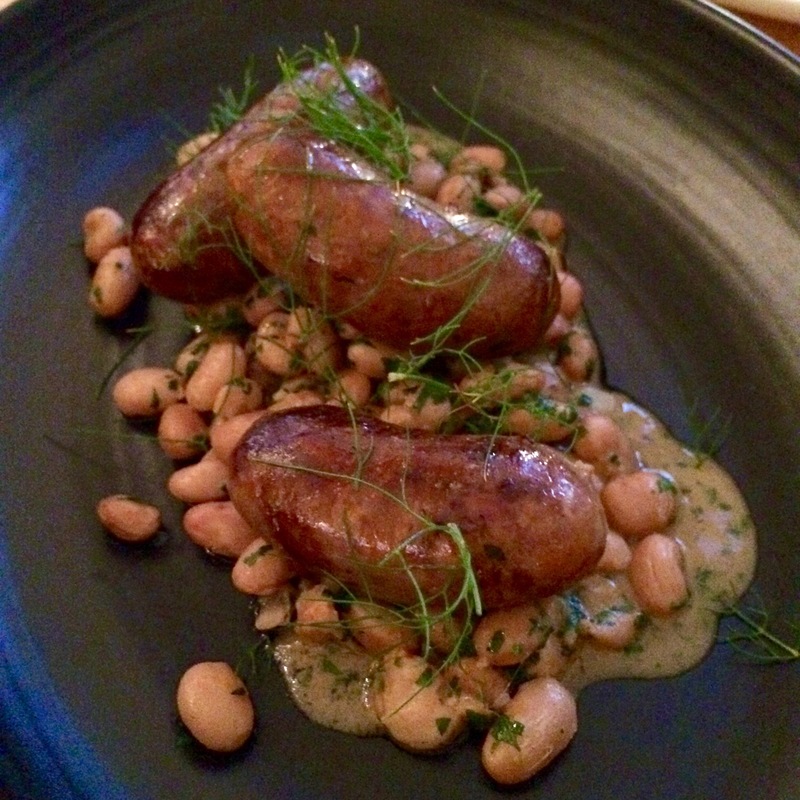 One item from the preview dinner often shows up: the grilled pork sausage. Served with shelling beans at the preview and opening, the more recent version replaces the legumes with lentils. 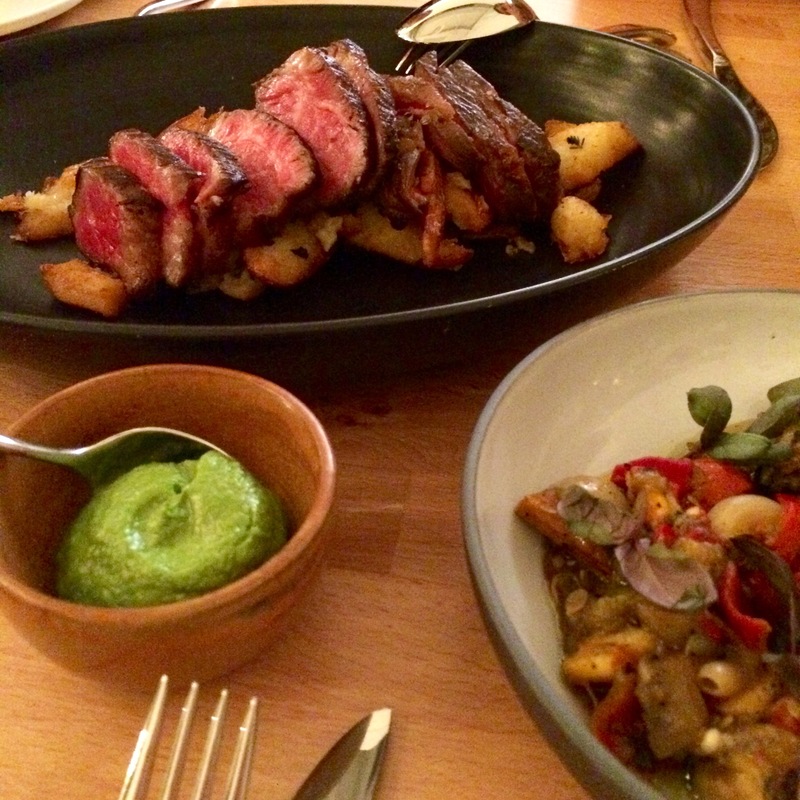 The New York strip with smoked bone marrow pesto is another item from the preview dinner that occasionally surfaces on their menu. We’ll be on the lookout for it’s next appearance, since their beef is meltingly tender. We don’t usually order desserts, but they always thankfully supply us with some. Like everything else on the menu, selections change seasonally. Previous versions have included an awesome salted date ice cream served with cardamom marshmallows and chocolate-sesame granola (left), a sweet corn ice cream with huckleberry and honey cake (middle) and berries with lemon cream and rose petal madeleine (right). All great ways to end a decadent meal. Enough about the food — what about their drinks? Head bar man Randy Mariani’s (Foreign Cinema) drinks are solid – often featuring savory items not normally found in cocktails. The Visions of Johanna (lapsang souchong infused rye, benedictine, vanilla agave, chinese 5 spice bitters) and November Rain (tequila, amaro meletti, turmeric, lime, angostura) are a great way to start any meal at Oro (left). Wine director Kelly Evans (formerly of Saison) has put together a list that not only complements their food, but thankfully leans old world. We have tended to order white and rosé wines (middle, right) to pair with our meals at Oro. It’s been an interesting experience watching Oro evolve. It’s great that Chef Fox has made Oro distinct from Commonwealth — for one, it gives us another place to eat his (and Chef Day’s) food. They recently started serving lunch and offering a happy hour. If we ever got off work early or actually worked in the City, it would be one of our destinations. It’s only a BART ride away from our home in the Mission so it’s easy for us to get there — especially if that porchetta ever shows up on their menu again. Update: Sadly, after only 9 months in operation, Oro officially closed on June 25, 2016. Hopefully we will find Chef Travis’ porchetta somewhere else in the bay area in the future.